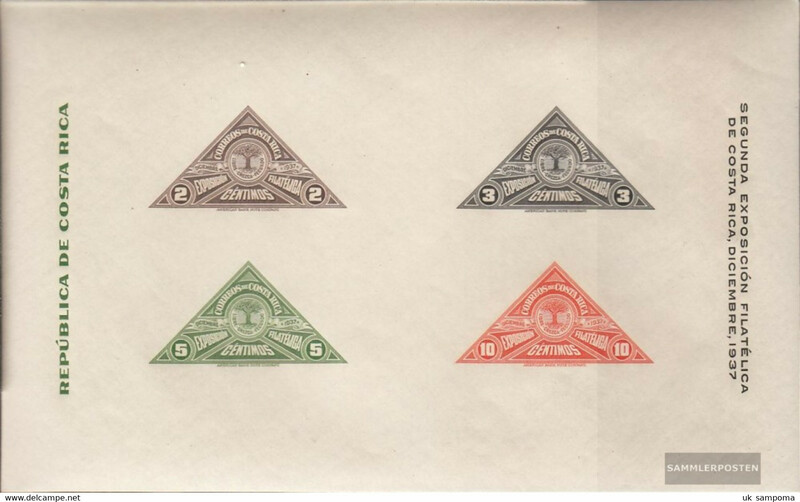 New Costa Rica 1907 10 Col Telegraph stamp Railway Steam Train IMPERF PAIR Mint No Gum. See text. 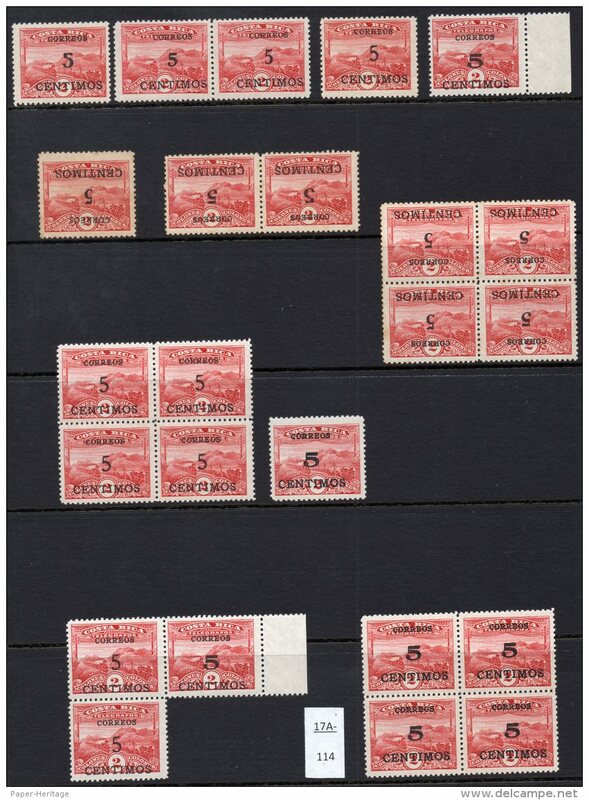 New Costa Rica 1907 5 Col Telegraph stamp Railway Steam Train IMPERF PAIR Mint No Gum. See text. New Costa Rica 1907 10c Telegraph stamp Railway Steam Train IMPERF PAIR Mint No Gum. See text. 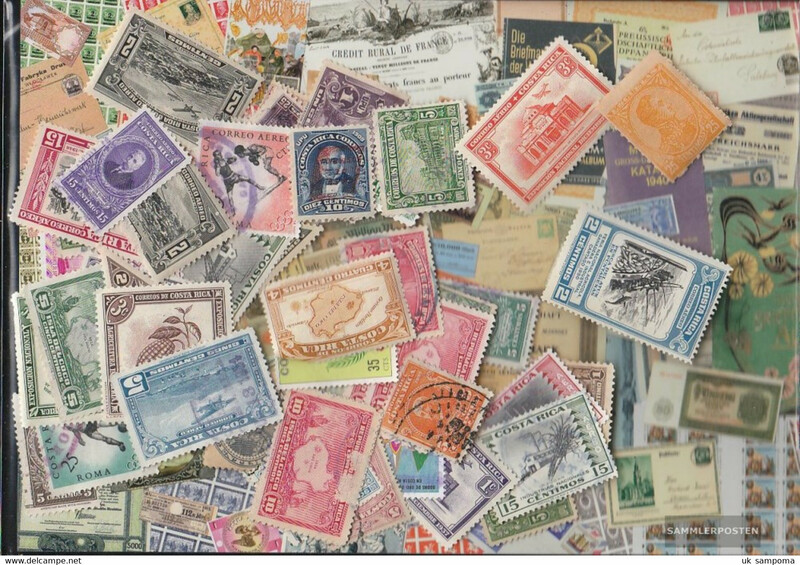 New Costa Rica 1929 5c/2Col Telegraph Lines and Steam Railway Train – many types and varieties – see text. 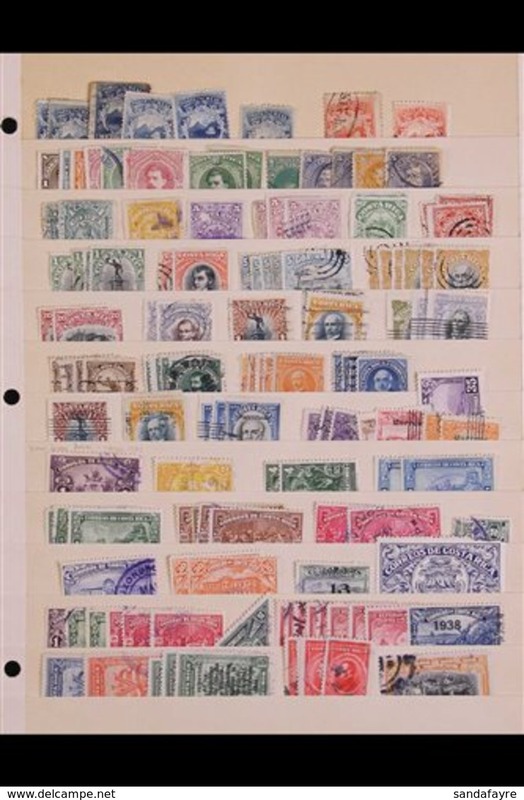 New Costa Rica 1907 Used set/10 (mixed perforation types). Between SG 57 and 76. 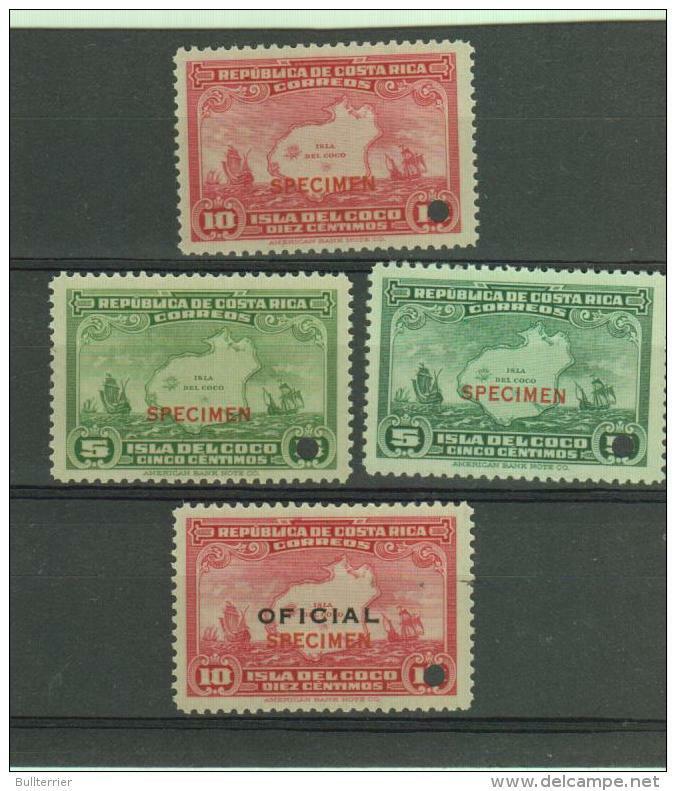 New Costa Rica 1901 5 Colones Jimenez MH, one of the two key values in this set. 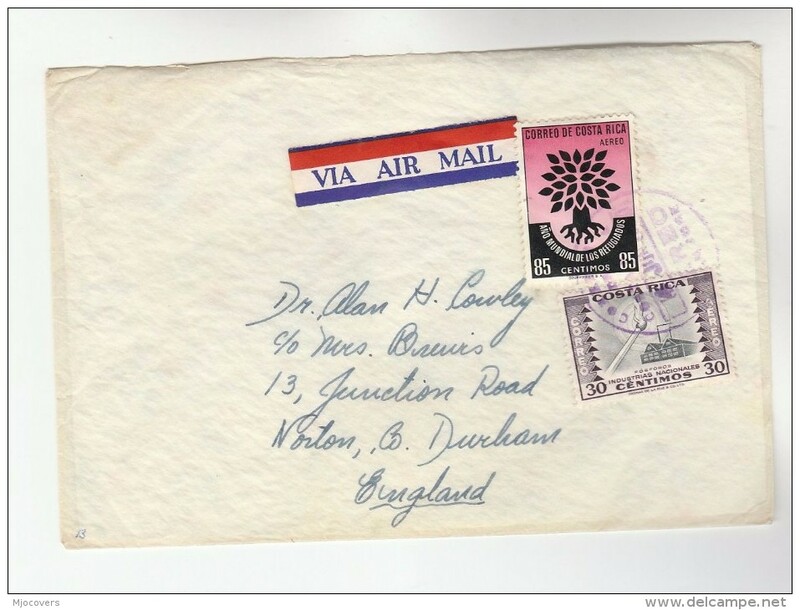 New (*) Costa Rica : Railway : 1945 5 Col ABN Co. Winged Wheel (no train) optd MUESTRA (Specimen). Mint no gum. 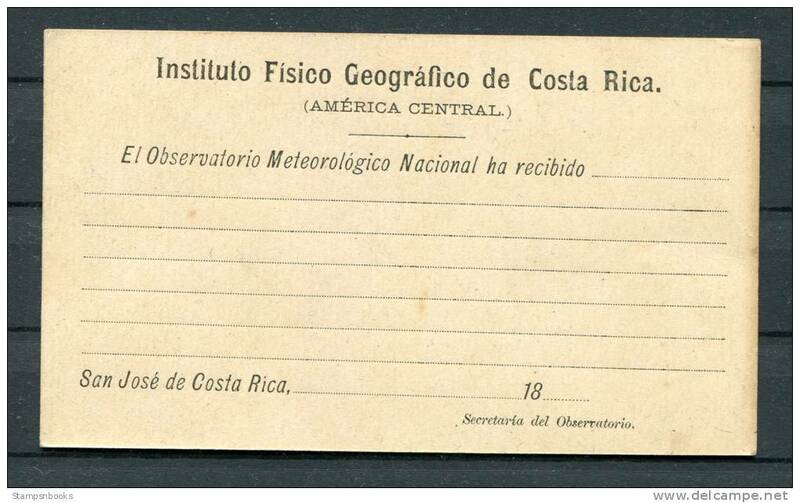 New (*) Costa Rica : Railway : 1945 1 Col ABN Co. Winged Wheel (no train) optd MUESTRA (Specimen). Mint no gum. 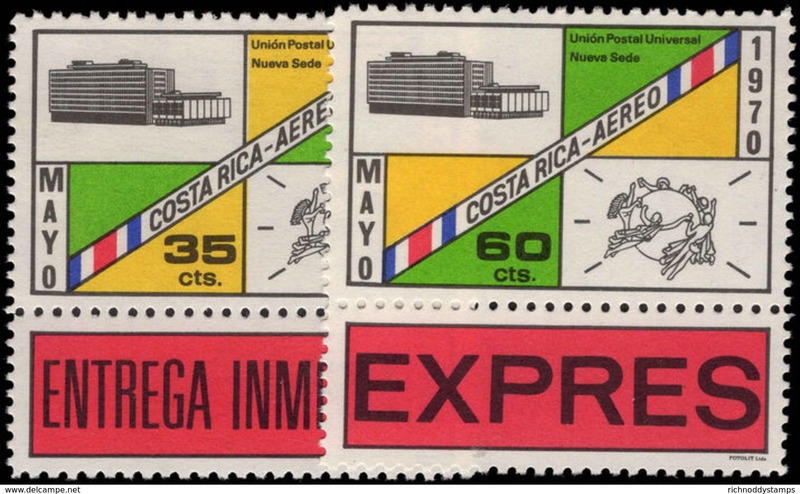 Costa Rica 1975 Radio Amateurs unmounted mint. 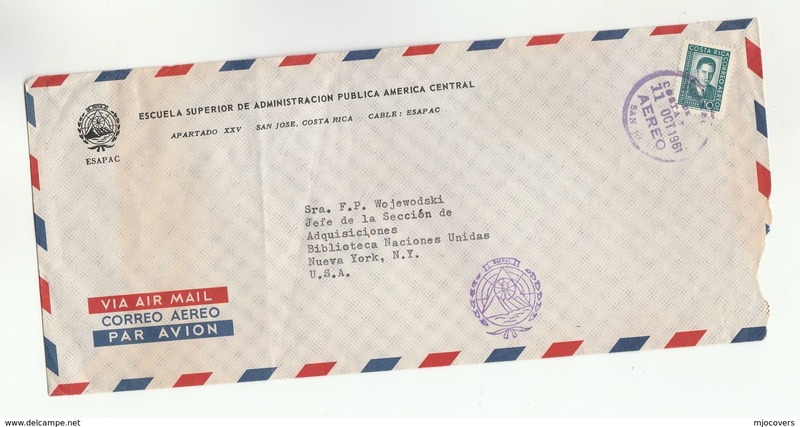 Costa Rica 1974 Insurance Institutue unmounted mint. 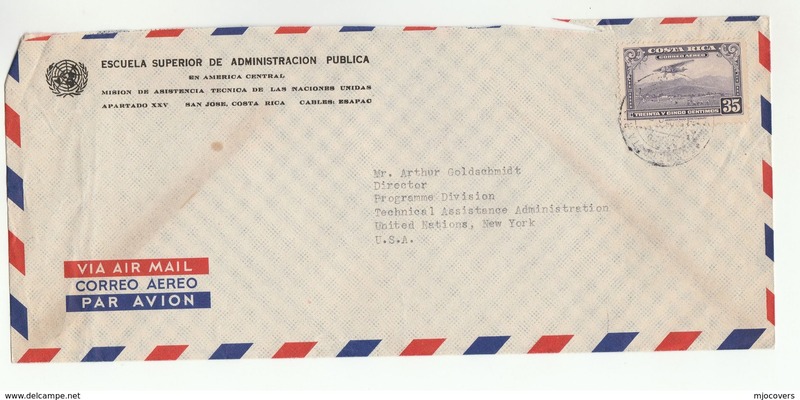 Costa Rica 1974 Electrical Institute unmounted mint. 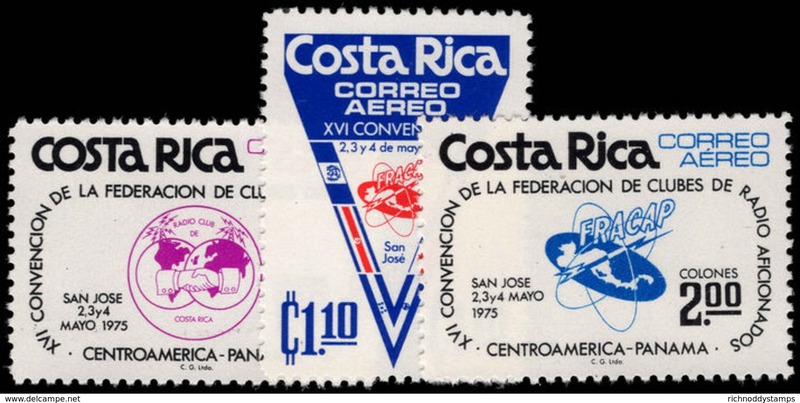 Costa Rica 1974 Air set unmounted mint. 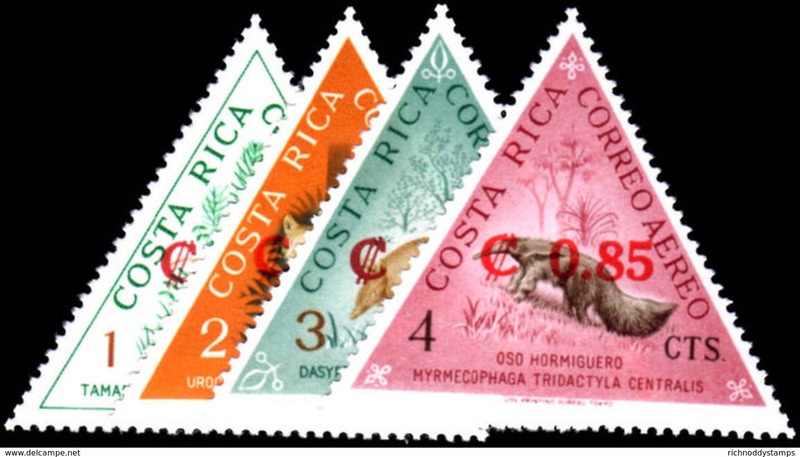 Costa Rica 1972-73 American Tourist Year unmounted mint. Costa Rica 1972 International Book Year unmounted mint. Costa Rica 1971 Central American Independence unmounted mint. Costa Rica 1970 Costa Rican paintings unmounted mint. Costa Rica 1970 Costa Rica 70 unmounted mint. 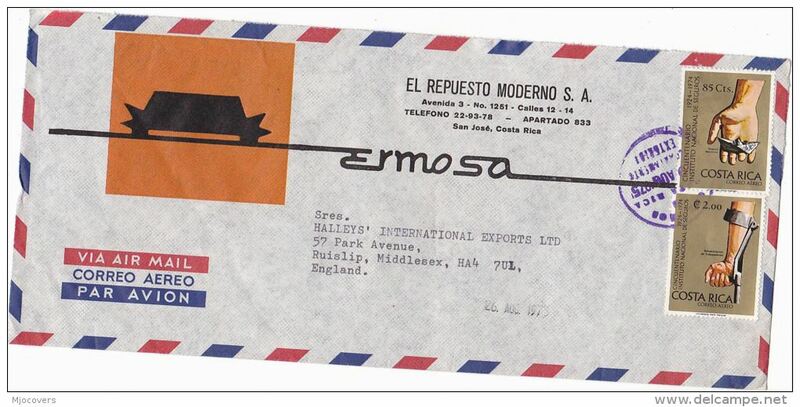 Costa Rica 1970 Air Special Delivery unmounted mint. Costa Rica 1969 Football unmounted mint. 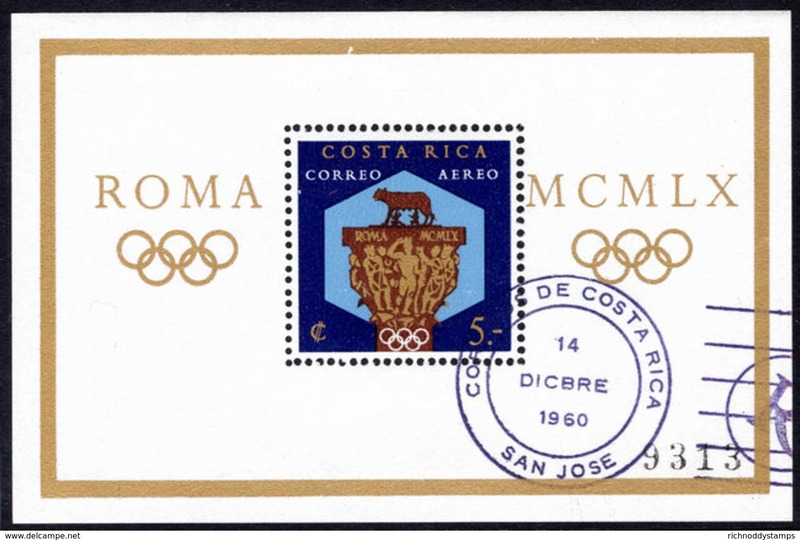 Costa Rica 1965 Olympics unmounted mint. Costa Rica 1968 Scouts unmounted mint. 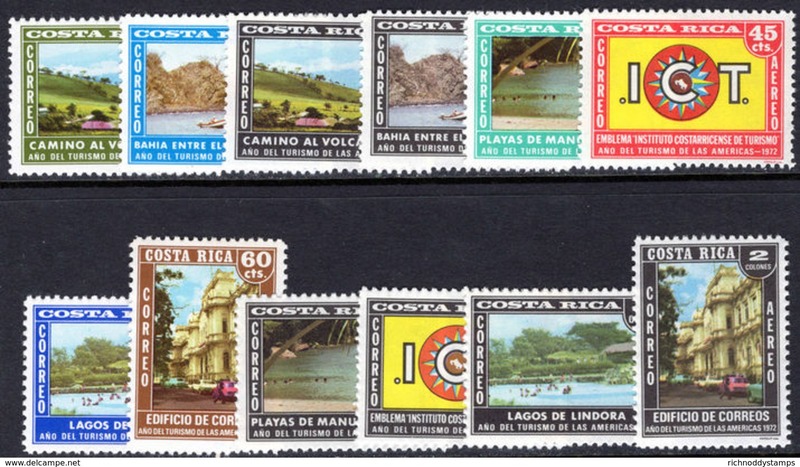 Costa Rica 1963 Stamp Centenary unmounted mint. Costa Rica 1960 Football unmounted mint. 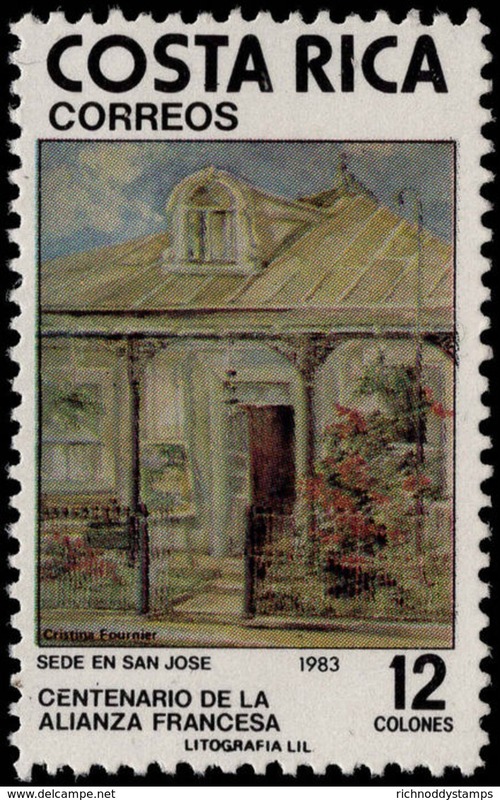 Costa Rica 1965 Chapui Hospital unmounted mint. 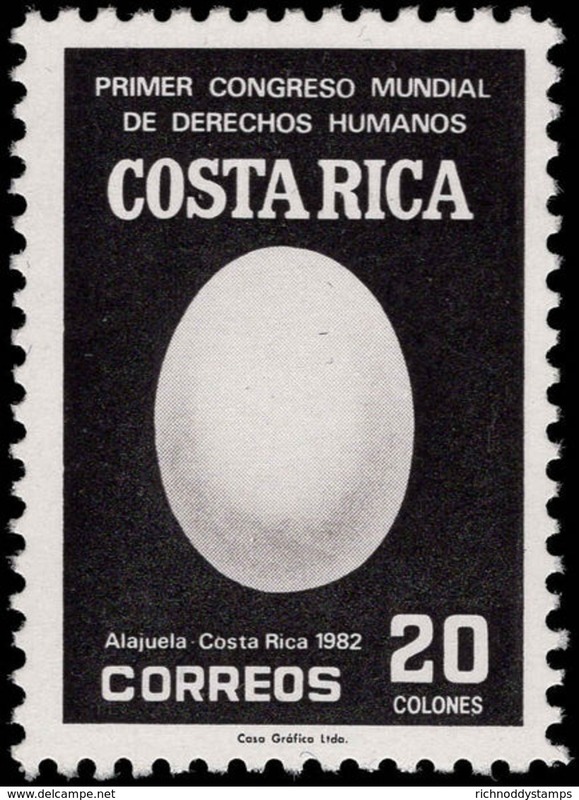 Costa Rica 1983 Human Rights unmounted mint. 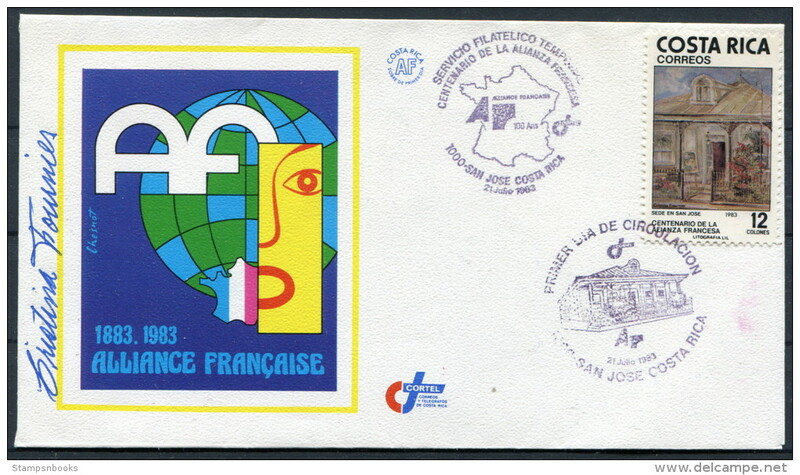 Costa Rica 1983 French Alliance unmounted mint. Costa Rica 1985 Red Cross unmounted mint. 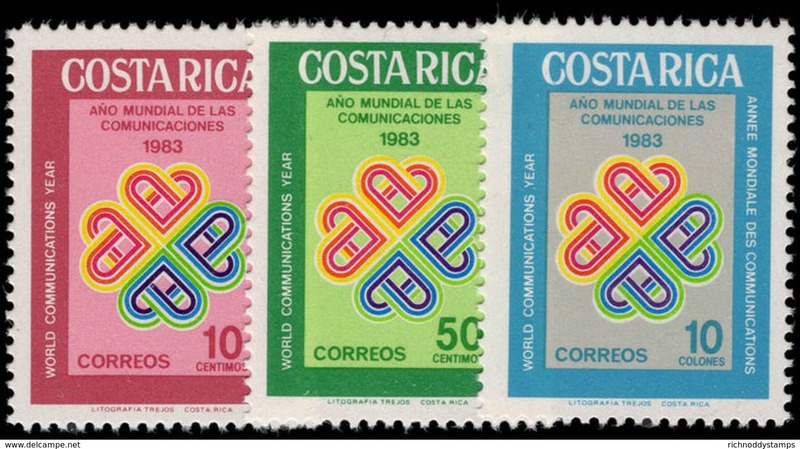 Costa Rica 1983 World Communications Year unmounted mint. Costa Rica 1969 Costa Rica 69 unmounted mint. 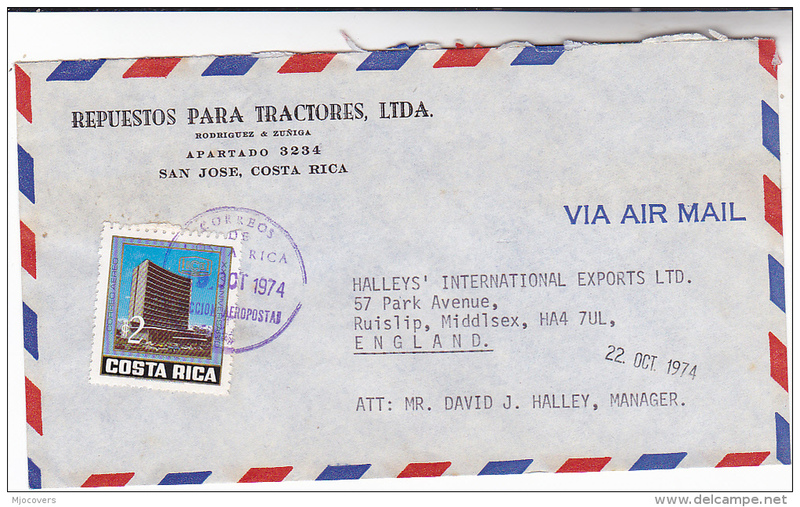 Costa Rica 1979 Obligatory Tax, Christmas unmounted mint. Costa Rica 1965 JF Kennedy imperf souvenir sheet unmounted mint. Costa Rica 1965 JF Kennedy perf souvenir sheet unmounted mint. Costa Rica 1965 Olympics imperf souvenir sheet unmounted mint. Costa Rica 1965 Olympics perf souvenir sheet unmounted mint. Costa Rica. 1927 (28 Oct) San Jose local stat card 2c blue usage + 3c blue adtl, tied cds. Fine / better. Costa Rica. 1903 (2 June) Sipnovio - San Jose (8 June). 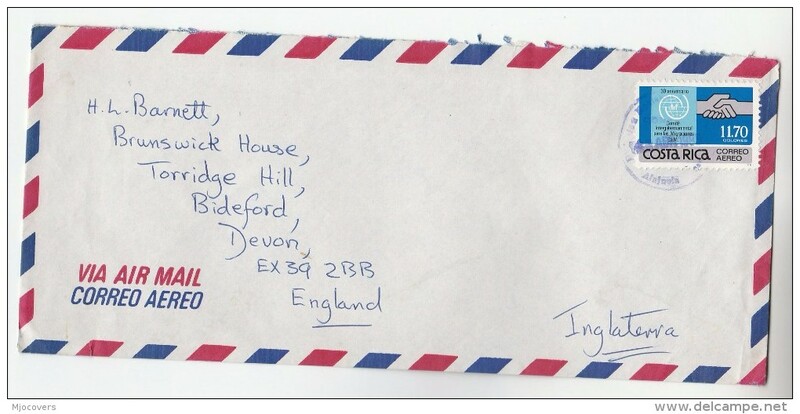 Addressed to Seminario. Via Livorn (6 June) 2c green stat card. Costa Rica. 1900 (15 June) Turrialba - USA, NYC. Via Livorn. Early fkd envelope 5c pair cds. Scarce. Costa Rica. 1895 (17 Ago) Local San Jose 2c green stat card with PRIVATE printed message. VF. 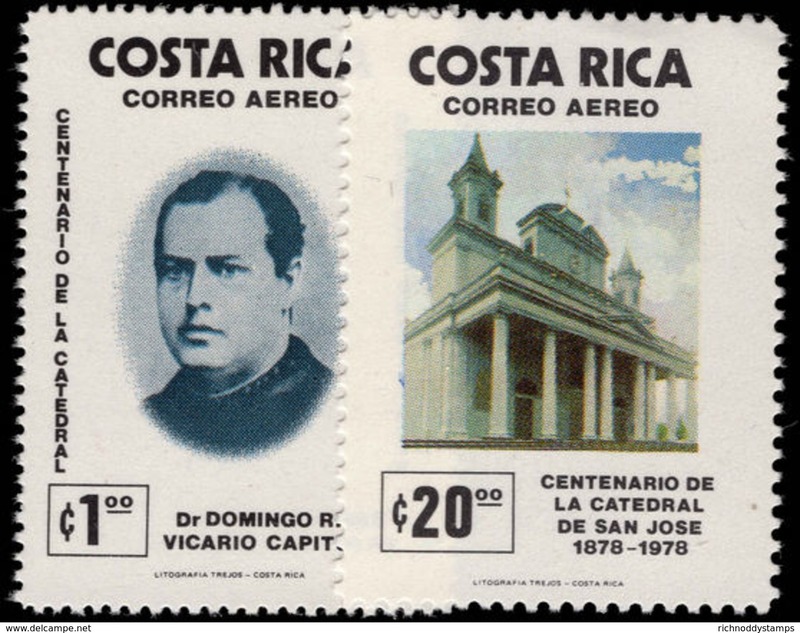 Costa Rica 1978 San Jose Cathedral unmounted mint. Costa Rica 1972 Agricultural Sciences unmounted mint. Costa Rica 1963 Animals Provisionals unmounted mint. Costa Rica 1963 Christmas unmounted mint. Costa Rica 2004 Olympics unmounted mint. 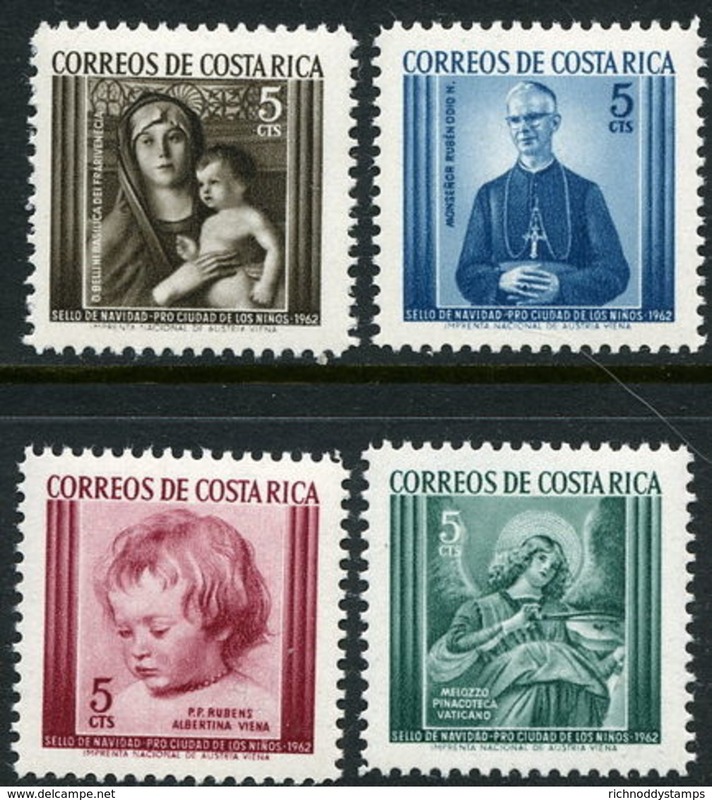 Costa Rica 1963 Stamp Centenary souvenir sheet perf unmounted mint. 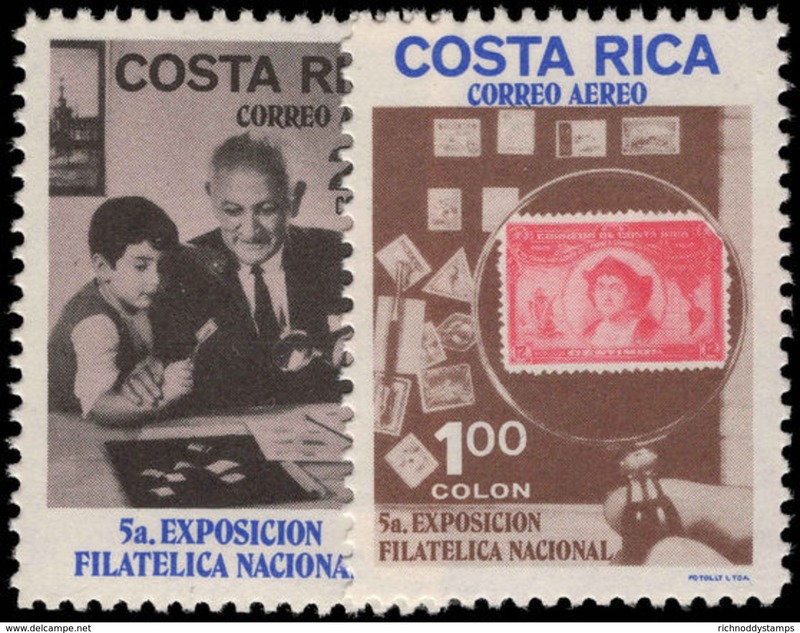 Costa Rica 1962 Air Provisional set unmounted mint. Costa Rica 1962 Obligatory Tax. 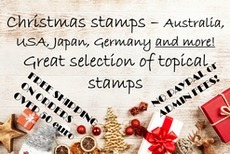 Christmas unmounted mint. 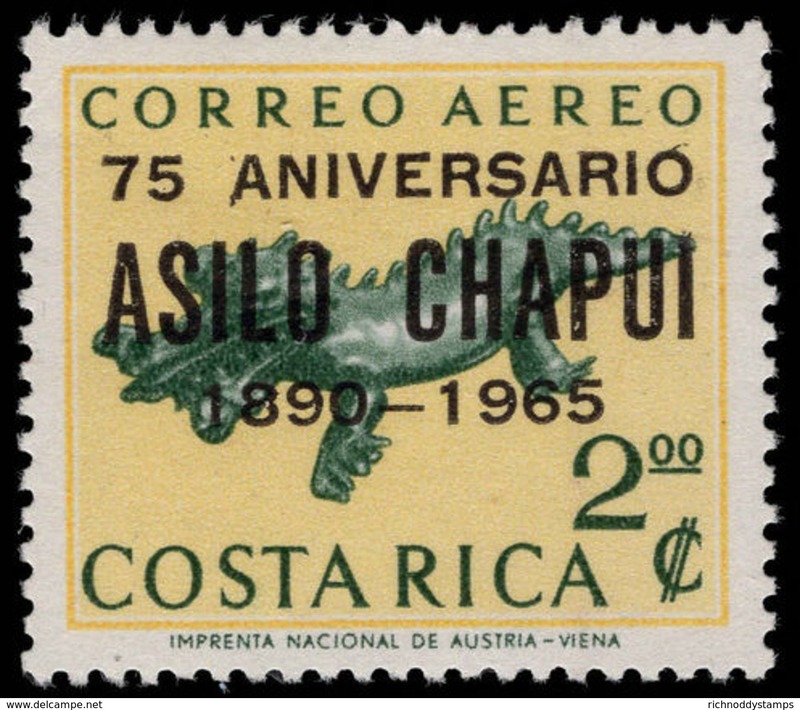 Costa Rica 1963 Stamp Centenary souvenir sheet imperf unmounted mint. Costa Rica 1987 8col Pre-Colombian Art strip unmounted mint. Costa Rica 1974 Costa Rican presidents unmounted mint. Costa Rica 1974 65c Orchid block of 4 perf 13 unmounted mint. Costa Rica 1974 2col50 Orchid unmounted mint. Costa Rica 1974 Roberto Brenes Mesen unmounted mint. Costa Rica 1972-73 American Tourist Year 1973 values unmounted mint. Costa Rica 2003 Fishes First Day Cover. Costa Rica 2003 Costa Rican Astronaut unmounted mint. Costa Rica 2002 Literacy Campaign unmounted mint. Costa Rica 2003 National Anthem Lyrics unmounted mint. 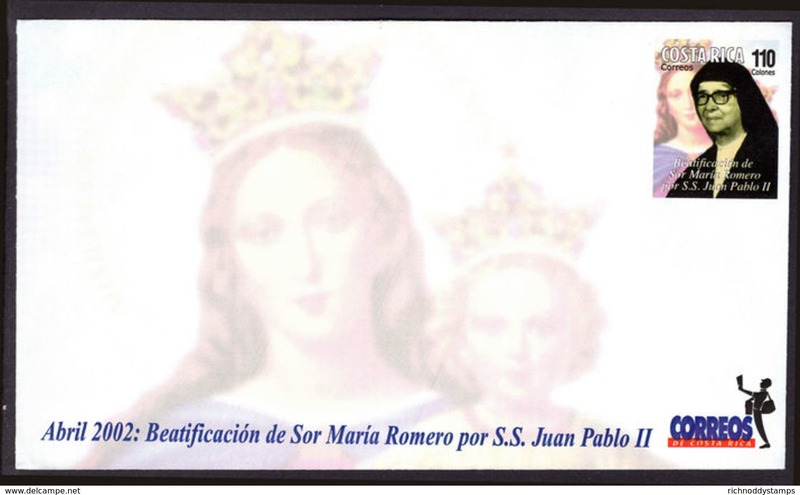 Costa Rica 2002 Beatification of Maria Romero unmounted mint. 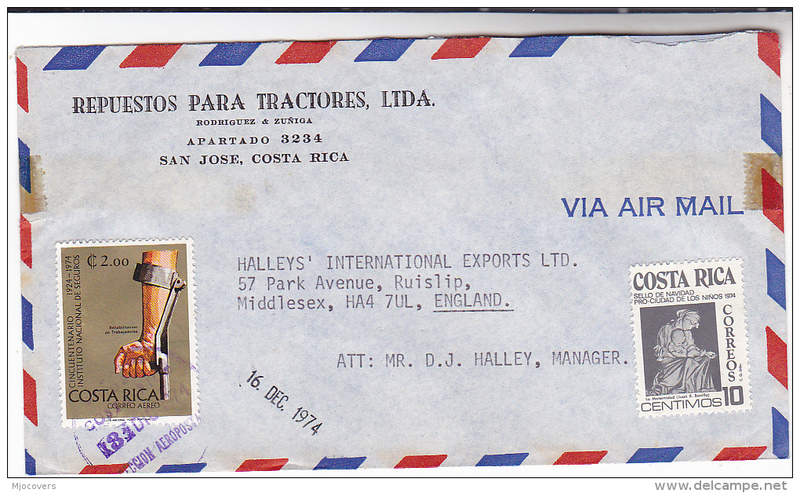 Costa Rica 2003 Costa Rican Astronaut printed envelope first day cover. Costa Rica 2004 Native Flora and Fauna on pair of first day covers. Costa Rica 2003 Pope John Paul unmounted mint. Costa Rica 2003 Charles Lindbergh unmounted mint. 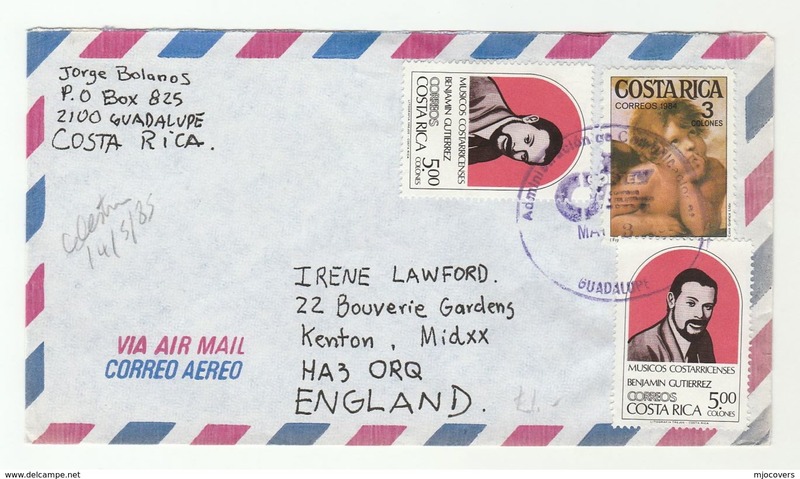 Costa Rica 2003 Charles Lindbergh first day cover. Costa Rica 2007 Special Olympics unmounted mint. 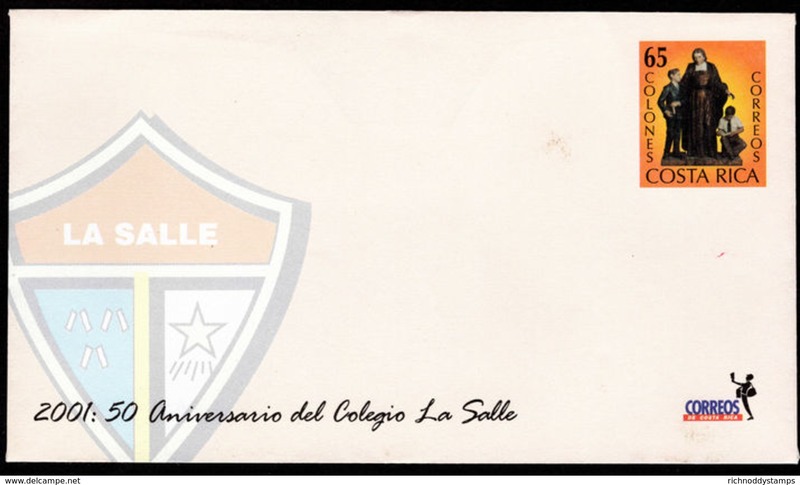 Costa Rica 2001 La Salle College printed envelope unmounted mint. Costa Rican2004 Miguel Angel Rodriguez unmounted mint. Costa Rica 1963 85c White Throated Capuchin unmounted mint. Costa Rica 1963 5col White-lipped Peccary unmounted mint. 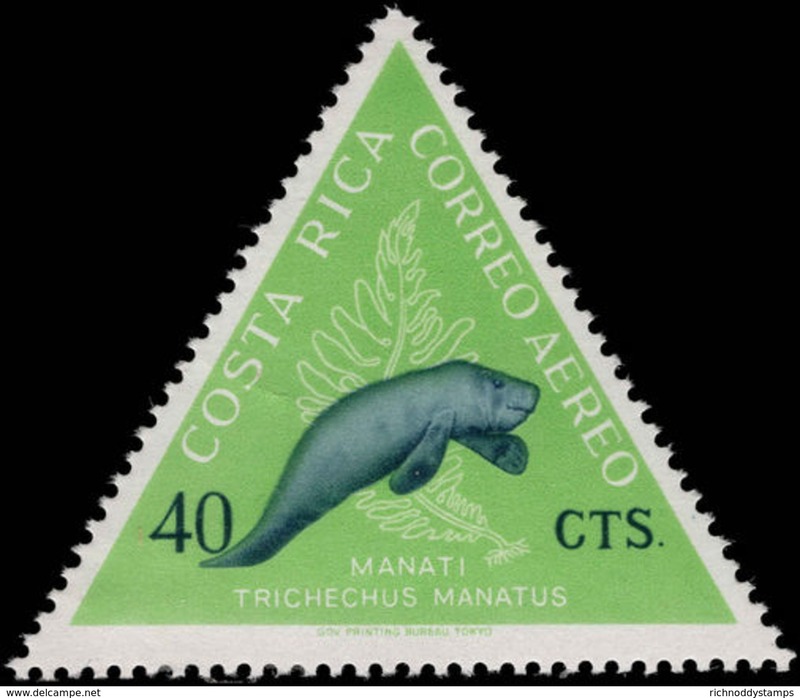 Costa Rica 1963 40c American Manatee unmounted mint. 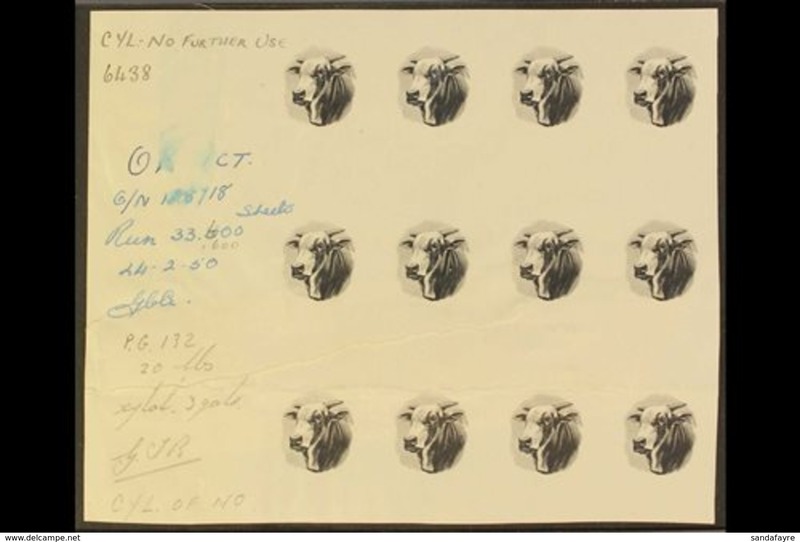 Costa Rica 1965 National Bank unmounted mint. Costa Rica 2007 Orchids sheetlet unmounted mint.